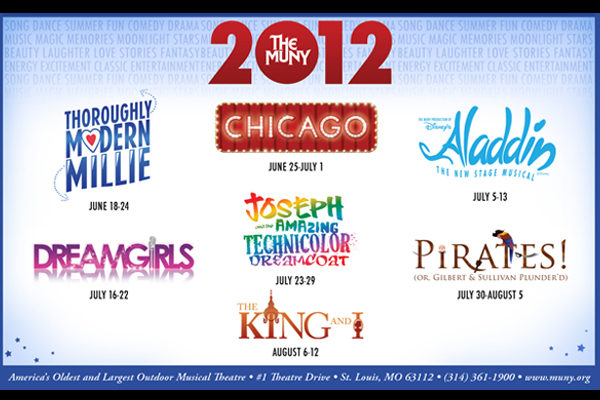 The Muny bills itself as “America’s Oldest and Largest Outdoor Theatre”. 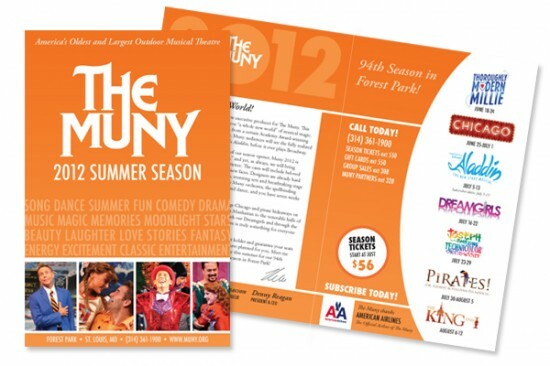 I was the in-house designer for their 94th season in 2012. It was a time of forward-minded change as an organization nearing its 100th anniversary attempted to evolve with changing times, new technologies, shifting demographics and the start of a new management era. 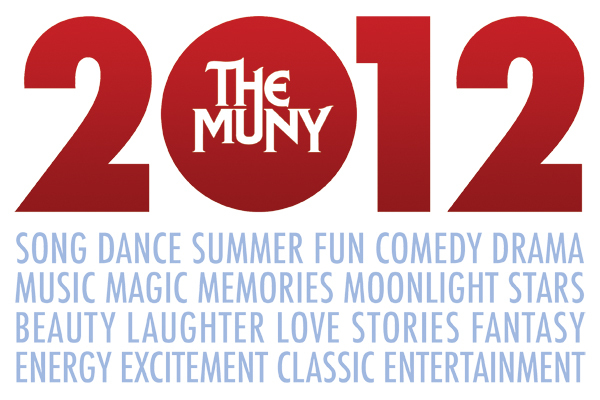 To present something fresh while accommodating the tradition that fueled the Muny and its reputation, I gave the theatre logo a new graphic treatment for 2012 instead of a complete redesign. The logo mark, familiar to most St. Louisans, was set within bold, modern, sans serif surroundings. A series of keywords was developed to push a particular set of values and provide a strategically enthusiastic voice. 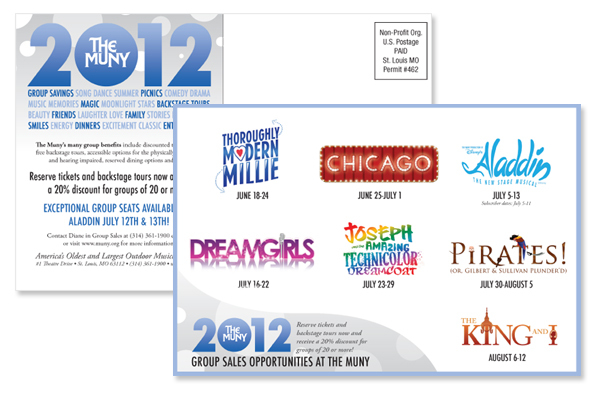 This treatment was used on almost all print and promotional materials, on the Muny’s website and even on a desktop wallpaper. When used along with the seven vibrant show logos (showcased separately in this portfolio), this branding treatment created a complete identity system for broadcasting that an established organization was doing new exciting new things. Color was also used strategically throughout the pre-season marketing push. For example, the 2012 season and new logo treatment were unveiled in Fall 2011 using bright heralding reds which, along with a series of wintry blues, were carried through the holidays. 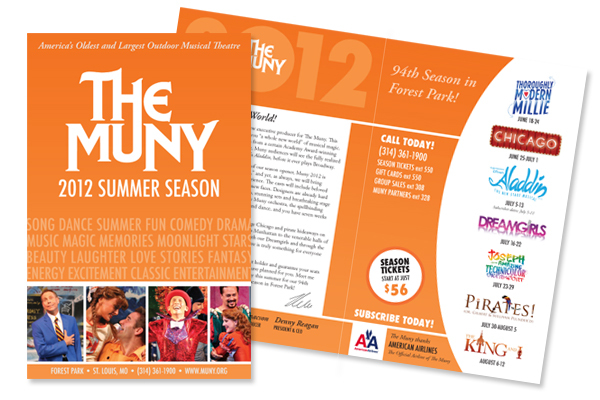 In the spring, the season brochure was done in strong orange to both make a statement and hearken to the coming warmth of summer. The logo treatment was specifically designed to work with a diverse palette, from holly berry red in December to ocean blue in July. The keywords were also designed for some strategic flexibility. For example, the 2012 Group Sales postcard integrated a series of additional keywords that were specific to tours and groups. 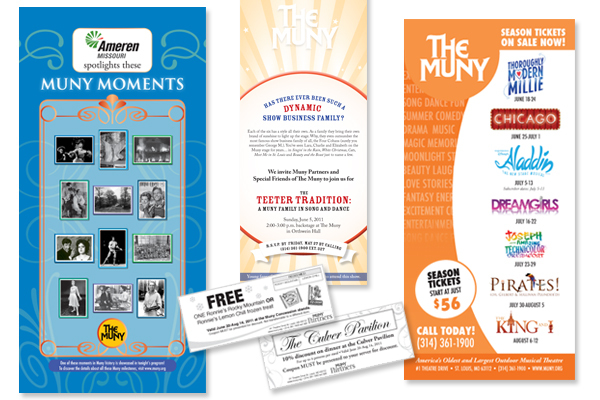 In general, I brought a fresh new look to all the pieces I created for the Muny, from outdoor lightboards to concession tickets to special event invites to posters and other advertising collateral. Even when the new logo treatment was not in use, I strove for cleaner design that communicated successfully and told a story. It was an educational experience to be a part of the Muny’s transition into a new era.